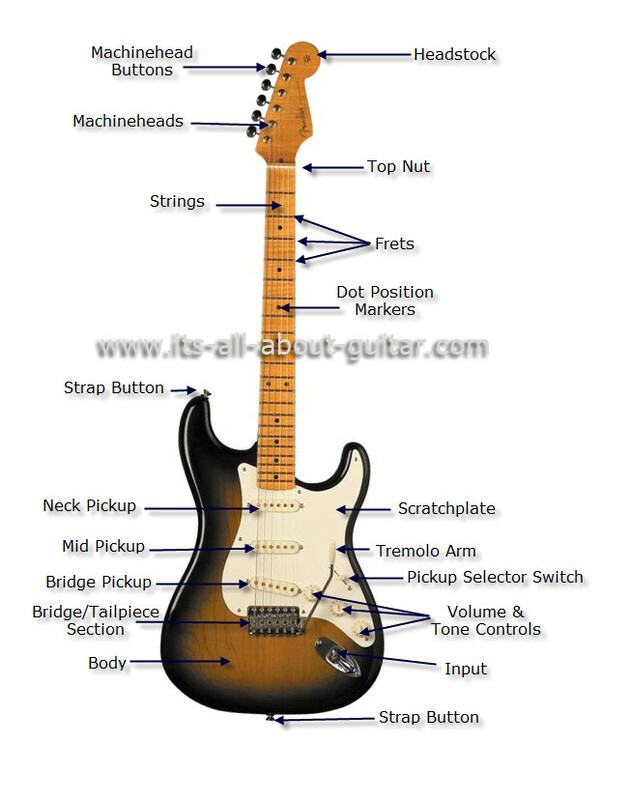 This diagram of an electric guitar shows it's main composite parts. The electric guitar is made for use with an amplifier. While the guitar itself is NOT connected to the electric mains supply, the Amplifier IS connected to the supply. The guitar is then connected to the amplifier with the lead provided, these have a 1/4" jack plug at both ends. The sound from striking the strings is then reproduced through the loudspeaker/amplifier system. The strings fitted are made of metal (they can be nickel plated, stainless steel, or even gold plated). Electric guitars are mostly played using a plectrum, although some guitarists, most notably Jeff Beck, are happy to use fingers rather than a plectrum. The electric guitar is very popular instrument, not only because the volume can be increased over that produced by acoustic instruments, but also because its tone can be varied by using the different 'pickups' and Tone and Volume controls on the guitar and amplifier. By using these various controls and switches, and effects pedals like distortion, overdrive, chorus, echo and delay, even more sounds are obtainable without even changing the method of playing. The majority of all electric guitars made these days are 'solid' body models for use only with amplification. There are however a number of semi-acoustic electric models which canbe played to a limited degree, without amplification. All of the parts on an electric guitar are upgradeable.